This guide will instruct you on how to adjust the Microsite Instragram settings. PicPic Social Microsites have a Content Delivery system that helps guests share their Photos, Videos or GIF to Instagram. The Instagram Settings within Microsites are specifically for GIF & Video but can be used with photos as well. GIF on Microsite - If a guest selects Instagram from the Microsite, we will convert the GIF to an .MP4 before emailing it to the guest. 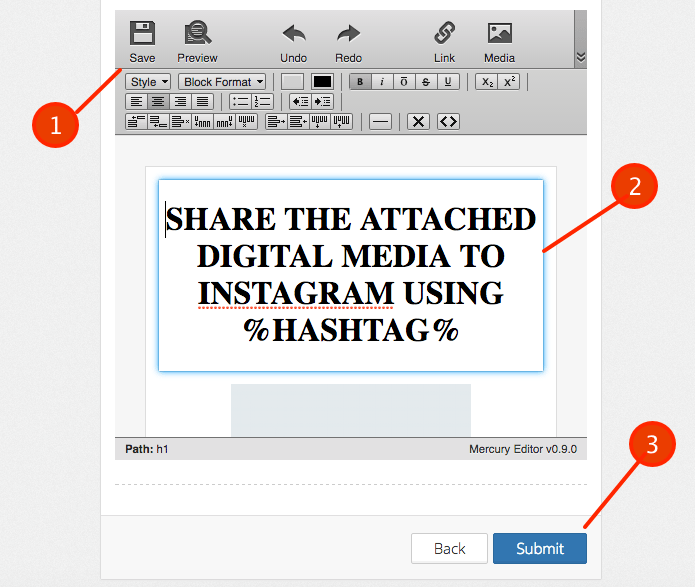 In the email, you can include instructions for the hashtag your guest should share the file with. Video on Microsite - If a guest selects Instagram from the Microsite, we will convert the video file to MP4 before emailing as well. In the email, you can include instructions for the hashtag that should posted as well. 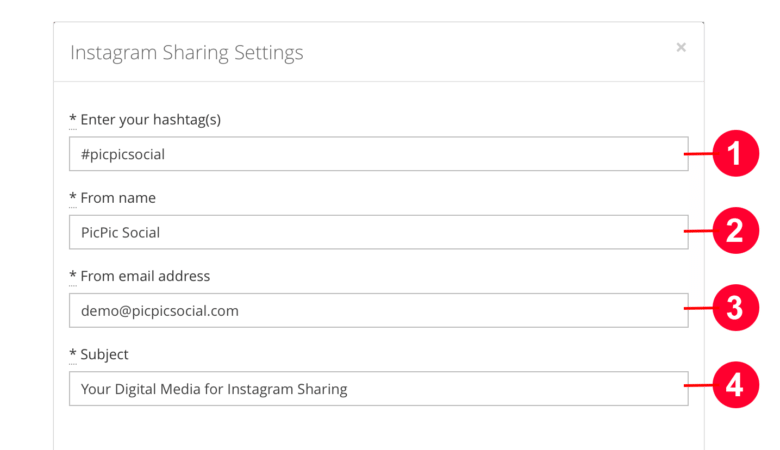 Within the Microsite Builder, go to Actions > Instagram Sharing for the desired Microsite template you would like to adjust the Instagram settings for. Hashtag - Enter the hashtag you are promoting. When we email your guest with their file, we will include a message that instructs them to share with the specified hashtag. This toolbar allows you to edit settings such as font etc..
Add the Text/Link/Media for the advertisement of the hashtag. We will replace %HASTAG% with the hashtag you entered into the 1st field Hashtag. Click Submit once you are done editing the settings to your liking.